The patented easy-to-use exact level™ system can be adjusted toaccommodate most people with "true-level", prescribed pitch or slope.The backrest has two built-in handles to make positioning easier. 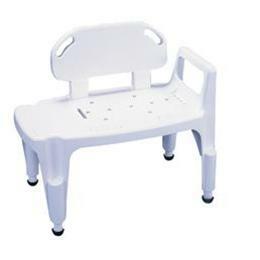 Thisbench also converts easily for either left- or right-hand bathtubentry. One-piece construction allows for a smooth transfer. Provideseasier access for people who have difficulty getting into and out ofbathtubs. Ideal for those who need to sit while bathing.